Shadowborn is dropping their brand new EP, “End of an Age” this August! 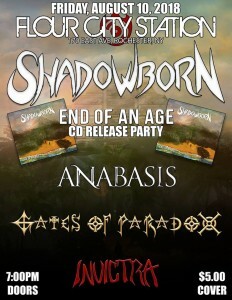 Come celebrate this fine occasion on the evening of Friday, August 10th at Flour City Station, where Shadowborn and friends will be hosting a killer CD release party! This will be an epic night filled with tons of original tunes from all the amazing locals.